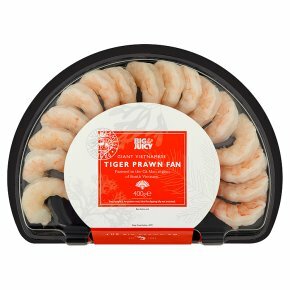 About these Prawns Tiger prawns are renowned for their fuller flavour and superior texture. Farmed in the Cà Mau region of South Vietnam, these Tiger prawns are fully traceable to ensure that we provide you with the highest quality prawn product we can deliver. Initially bred in salt water hatcheries, after two weeks they are transferred into vuông tôm (ponds) that are aerated to maintain water quality. Harvesting from the vuông tôm is done using hand nets. The prawns are then specially peeled to remove the vein and cooked. Afterwards, they are carefully 'fanned' out on a self draining tray and quickly frozen to preserve their quality and flavour. Finally, an ice glaze is applied to protect the prawns during storage, packing and transit. A Healthy Option Tiger prawns are a significant source of Selenium which contributes to the normal function of the immune system. They are also high in protein and low in fat. A Dipping Delight These prawns are perfect for dipping in your favourite sauce and using their tails makes them really easy to handle!